Check state laws, they vary state to state. Here in Wi you'd be in trouble. First of all, you gotta remember that most of the people in Lawton are crazy so there's no tellin what might happen. Second, with the liberal open carry laws in Ok I believe all they can do is tell you to leave. In WI you get in trouble even if the sign isn't 5x7 and lying on the floor under the doormat. Hand the manager one of these, and take your business elsewhere. They're available at the link in my sig. What if you spend your hard earned money on tires at a service shop that understands your Constitutional rights? The real issue here is the state law and what it says and requires of the CCer AND the business. 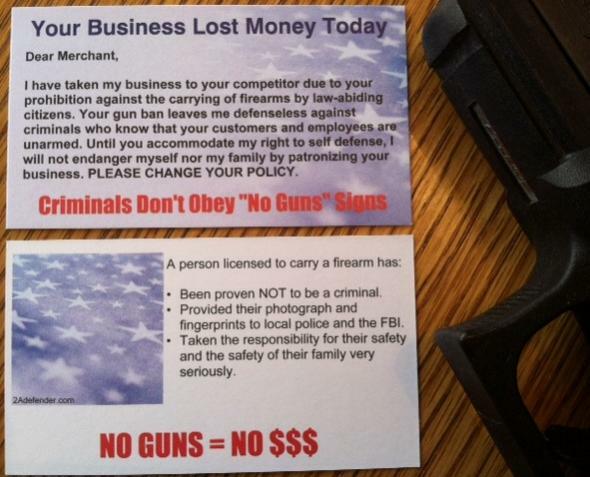 In SC and I am sure elsewhere the business is required to post a specific sign with a specific size and specific notification and graphics--if this is not done, you certainly can walk into a business CC--being CC, even if the business owner or manager is anti-firearm, it will make no difference since he will never see the firearm. Should, for some reason, it becomes obvious and he asks you to leave, you should leave, but only on a direct comment from management--the fact that you are in the store and are CC is not illegal since the signage was not there or incorrect in the first place. If your state allows CC with no restrictions on a business and/or the signage is incorrect, but also does not allow OC, you are breaking the law being OC in the business or not. Personally this a "haha" thread (I do not like using the "D" word) sounds like a yada yada. In Texas very specific 30.06 sign anything else all they can do is ask you to leave. In WA signs don't mean jack. I still choose to take my business else where if I can, but when I can't they can placard the entire store front in signs and I can still walk right in. Concealed carry is concealed for a reason, nobody needs to know.